The word pikal (also spelled pakal) is a Visayan dialect word that literally means “to rip.” In the Filipino martial arts, the name is generally used to describe the method of holding a knife in a reverse grip (aka ice pick grip), but more specifically denotes a reverse grip with the edge inverted, facing toward the user. The Spyderco P’Kal is a specialized folding knife designed specifically for reverse-edge knife tactics. The P’Kal was designed in collaboration with Craig Douglas, a career law enforcement officer, life-long martial artist, and the founder of ShivWorks. 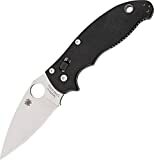 Douglas, also known as “SouthNarc,” is a huge advocate of reverse-edge knife tactics and has collaborated on several method-specific knife designs, including another Spyderco knife, the Spyderco Reverse. Unlike the traditional use of a blade where the edge is facing outward and is driven by “pushing” motions using the smaller muscle groups located in the front of the upper torso, reverse edge movements are driven by ”pulling” motions using the large muscles located in the back. These techniques are point-driven. The result of the pikal method is a penetrating stab that creates a deep laceration as the blade is pulled (ripped) out of the target. The P’Kal has a fully flat ground, 2.95” (75 mm) modified Wharncliffe style blade. The leading edge of the Wharncliffe blade design only amplifies the ripping qualities of the P’Kal, since the energy applied during the cut is transferred toward the tip. The blade is constructed out of 0.125” (3.2 mm) CPM S30V stainless steel. Crucible Steel Company’s proprietary powdered cutlery steel is one of the best knife steels on the market with its high corrosion resistance and edge retention capabilities. It is one of my personal favorites, especially for a purely defensive blade. When closed, the P’Kal is 4.40” (112 mm) long, making it an excellent size for Every-Day Carry (EDC). Weighing in at just 3.7 ounces (105 grams), the added weight of the P’Kal is hardly noticeable when carried in the front pocket. The P’Kal has a black G-10 handle with reversible steel wire pocket clip that can be mounted on either side, allowing the user to opt for an edge-forward or edged-back carry configuration. The tension on the clip is very tight out of the box, but loosens up to be just right with a little use. When seated in the pocket, the knife rides just high enough to allow the use to gain a firm purchase on the handle for rapid deployment. The handle is extremely comfortable when held with either a forward or reverse grip in the intended reverse edge configuration. The addition of a secondary finger notch on the edge side of the handle (which doubles as a cutaway for the thumb hole) allows for comfortable use with a traditional edge-outward grip. At first glance, this notch appears to be located too far back on the handle to be practical; however, once you get the knife in your hand, you quickly realize that it is placed in exactly the right position given the blade and handle geometry. The liner has 1.5-inches of aggressive jimping along the portion that make contact with palm. This jimping, which extends just past the G-10 scales, coupled with the rough texture of the scales themselves makes for an exceptional gripping surface that works even when wet. Unlike fixed-blade knives that can be designed with a more neutral grip, folders are more limited due to the blade folding into the handle. It is a rare thing to find a folder that works well in every grip. If you keep in mind that the P’Kal is a fighting knife made for use with a full-hand grip, then you will find the design works for multiple grip configurations. The P’Kal has a removable post-style Emmerson Wave feature for rapid deployment. The recommended carry method is tip up at the front of the pocket. When carried in this configuration, the knife can be simultaneously opened on the draw stroke by hooking the post on the front of the pocket. When gripped properly, the knife can be rolled into the pikal grip position immediately after opening. Of course, the blade can also be opened manually using the Spyderco’s famous round thumb hole. When using the thumb hole to deploy the blade, the handle geometry ensures that you will find yourself with a natural reverse-edge forward grip upon lockup. The ambidextrous caged Ball Bearing Lock located behind the tang is one of Spyderco’s strongest locking mechanisms. This unique, patented locking system has a ball bearing that sits inside a slightly curved channel which provides a track for the bearing. The ball bearing is pushed toward the blade by a small shaft that is surrounded by a coil spring. As the blade rotates open, the ball bearing pushes past the detent and into the new channel to lock the blade in position. Since the ball bearing rolls freely throughout the blades travel, the action on the P’Kal is very smooth and the lockup is firm every time. My knife was very tight out of the box, to the point where I would have multiple failed wave deployments. This was a problem that needed to be fixed because I do not wish to lose any fingers from a blade collapsing on my hand. After applying some Nano-Oil and working the blade a couple hundred times in hopes that it would loosen up, I went to the tool box and grabbed a hex wrench. I loosened the pivot pin screw ever so slightly, which immediately resolved the problem. The Spyderco P’Kal is in my opinion one of the best purpose-built defensive blades on the market. As a big proponent of reverse-edge knife tactics myself, I see tremendous value in the P’Kal as a dedicated defensive blade and cannot recommend it highly enough for such a purpose. It have become my go-to EDC folder. One of the benefits of the P’Kal is the availability of a training version of the knife. Even though the cost for the trainer is right up there with the cost of the live version, I can’t stress the importance of the trainer enough. It is an investment that will have a far greater return if you dedicate yourself to putting in the training hours. When choosing to carry a specialized knife like the P’Kal as a self-defense tool, it is important to seek out proper instruction from a qualified edged weapons instructor. For those who may not have access to an instructor, there are other alternatives. Craig Douglas has two excellent DVDs on the ShivWorks Reverse Edge Methods if you can find them. Scott Babb of Libre Fighting also has a newly released DVD titled, “Reaper Method – Tredecim” which covers his approach to rapid knife deployment / employment (think in terms of the Japanese art of Iaido) using a reverse-edge (scythe) grip. Both men take different approaches to reverse-edge knife tactics, but they each present valuable information on the topic. 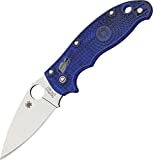 I recommend purchasing the Spyderco P’Kal at Amazon or BladeHQ. Please consider that purchasing anything through any of the links on this website helps support BladeReviews.com, and keeps the site going. As always, any and all support is greatly appreciated. Thank you very much.